As recent weather has shown, a lot of snow and ice can really make daily routines difficult. For many seniors, just a little bit of freezing weather can cause problems. But there are some steps they can take to help mitigate any issues. The easiest thing to do, of course, is stay home if possible. If there are no pressing reasons to leave your home, stay inside where it’s warm and dry and watch the weather from the comfort of your favorite chair. Sometimes, though, a trip outside is unavoidable. Even a little bit of snowfall can wreak havoc on the roadways. If you have an older loved one who still drives, makes sure they have proper traction devices on their car. Tire chains are great for situational needs, but can be difficult to attach, especially for seniors. Studded tires for the winter season removes the need to put on and take off snow chains, but are much more expensive. Seniors who use walkers or a cane should inspect the tips of their supports. It’s a good idea to occasionally inspect the tips – if worn down, replace before the next cold snap to be prepared. Or just avoid driving all together. Public transportation is often the best option for seniors when an outside trip is needed, no matter the weather. And even though the bus stop may be a short distance away, care and caution are still needed when the sidewalks get slippery. Proper footwear is a must – insulated boots or shoes with good tread will keep feet dry and warm and can provided added stability in icy conditions. Seniors who use walkers or a cane should inspect the tips of their supports. It’s a good idea to occasionally inspect the tips – if worn down, replace before the next cold snap to be prepared. There are even products for wheelchair tires that can make navigating in the snow or ice much easier. When returning home after a walk, make sure the bottom of the walker or cane and shoes are dry. The rubber is great for walking in slippery conditions, but once inside, the wet shoe soles are a slipping hazard on hard indoor flooring. Make sure to dress warmly as well. Hypothermia, which can lead to heart attacks or strokes, can happen when the body temperature drops under 96 degrees. Dressing in layers will help keep your body warm, and don’t forget warm gloves and a hat to keep exposed skin warm, too. A scarf is also a necessity to keep your neck, ears and face warm. While out on a walk, keep your eyes open and pay attention to the walking surface. Black ice can be hard to spot if you’re not careful. Allow a little more time to get to your destination and move a little bit slower. A longer walk is preferred to a slip that could cause injury. 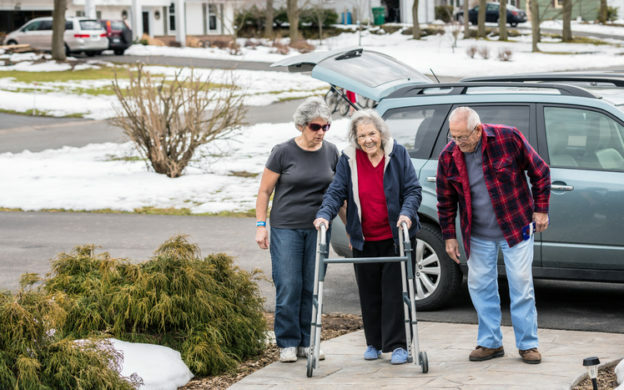 Sometimes, a trip outside in harsh conditions is a necessity for seniors. But steps can be taken to make sure they get to their destination safely.